Number passing activity. Groups of 4 to 6 players, two balls per group, and players count-off numerically. Player&apos;s 1 and 4 begin with a ball as shown. Players pass in numerical order. Begin with two-touch, progress to one-touch, and then one-touch/two-touch alternating. To increase the challenge, pass in reverse order or odd/even numerical order. Body mechanics and general technique. Accuracy and weight of the pass. Movement off of the ball. Correct angles of support. Develop timing, rhythm, and tempo. 4 v 1 (15 x 20 area or as needed). 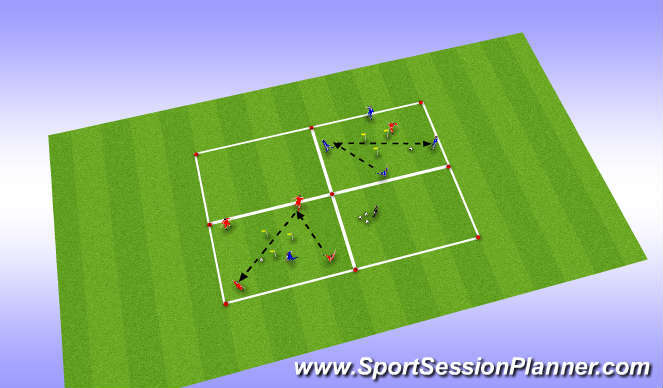 Using corner flags or disc cones (3 yards wide apart) create a triangle in the middle of the area as shown. The 4 players in possession look to score with a penetrating pass through the triangle to a teammate. The defender tries to cut-off the pass, but is [not] allowed to defend inside the triangle. Progress by limiting the number of touches in possession. Note: if the defender wins the ball, they score by dribbling outside of the area. Rotate the defender after a period of time. Body mechanics and general technique. Accuracy and weight of the pass. Passes to feet versus passes to space. Movement off of the ball. Correct supporting angles. Speed of play. Decision-making. 8 v 4 (30 x 40 area or as needed). On the perimeter of the area, create 8 small goals as shown. 8 v 4 possession activity in the middle. The 8 players in possession are awarded a point for maintaining possession for 8 consecutive passes. 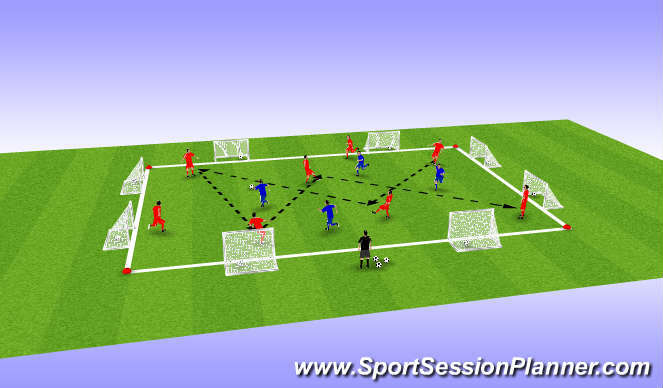 The 4 defending players attempt to win the ball and quickly pass through any of the 8 small goals along the perimeter. Play for points or time, rotate players accordingly. Team shape and balance. Change of rhythm in possession (short, short, long). Be patient, don&apos;t panic. Verbal and non-verbal communiation. Defenders - when you win the ball, look for opportunities to penetrate immediately. 8 v 8 with goalkeepers to two large goals (half field or as needed). Formation: 1:3:3:2 versus a 1:3:2:3. Regular game. FIFA rules apply. Both teams compete for possession of the ball and are encouraged to look for immediate and effective attacking and scoring options. Play for points or time. 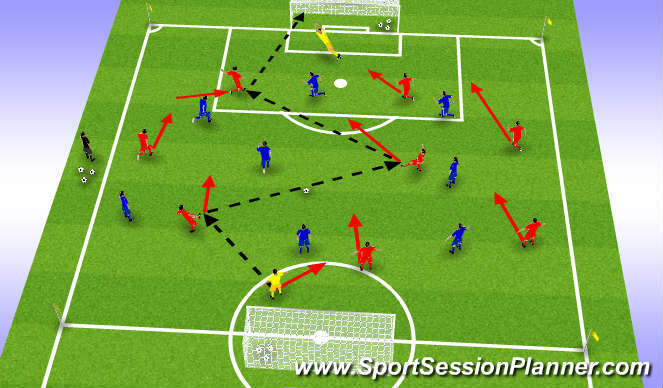 Attacking Principles: Penetration. Depth. Mobility. Width. Improvisation. All of the above. Gradually reduce heart rate. Modified dynamic movements and static stretching - focus on major muscle groups. Review session. Remind players of upcoming training, games, or other events.